Pink’s Hot Dogs on La Brea Avenue, which was recently named one of the best casual eateries in the United States by the website Daily Meal, is celebrating one of America’s favorite foods in July during National Hot Dog Month. Pink’s is serving up the America the Beautiful Dog, a 12-inch jalapeño sausage topped with pastrami, bacon, lettuce and chopped tomatoes, and the new La La Land Dog, topped with guacamole, chopped tomatoes, bacon bits and sour cream. However, with 36 hot dog varieties to choose from, Pink urges his customers to try them all. Many are named after the stand’s celebrity clientele – and a dozen different hamburgers. The Martha Stewart dog is a 9” stretch dog with relish, onions, bacon, chopped tomatoes, sauerkraut and sour cream. The Ozzy Spicy Dog, named for Ozzy Osbourne, is a spicy Polish dog with nacho cheese, American cheese, grilled onions, guacamole and chopped tomatoes. Pink’s has been an icon in Hollywood since 1939 when Richard and Beverly’s parents, Paul and Betty Pink, started with a pushcart near La Brea and Melrose avenues. Pink’s Hot Dogs was recently named by the Daily Meal as one of the 101 Best Casual Restaurants in America. The website ranked Pink’s as the 15th best casual eatery in the United States – up from number 28 in 2016 and ahead of seven other Los Angeles-area restaurants on the list. The Hollywood Chamber of Commerce also recently recognized Pink’s Hot Dogs at its “Heroes of Hollywood” luncheon, which celebrated iconic establishments and individuals in the community. 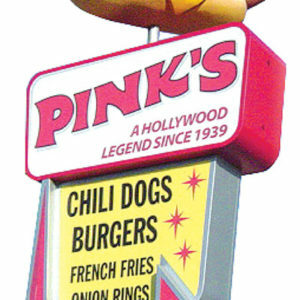 Pink’s Hot Dogs is located at 709 N. La Brea Ave. For information, call (323)931-4223, or visit pinkshollywood.com.